Since Yule is upon us (also known as the Solstice to some), I thought I would share a conversation Katie and I had with Mr E about how his people celebrate this important day. Happy Yule, everyone! NL: Yule is coming soon so I thought maybe you could tell us about how the elves celebrate it. Mr E: Oh Yule, I can’t wait! NL: What is the purpose behind it? Mr E: The main purpose of Yule, the reason it began, has to do with winter and the fact that winter can be a dreary, horrible time. It can be a time of famine and lack, and because of this, we have a holiday during this time, to counteract it. NL: Is there a metaphysical side to this? Mr E: Yes, it is metaphysical and physical. The physical part would be the sun returning. NL: Right, I was going to say that this is also connected to the shortest day of the year. Mr E: The Solstice, yes. On the 21st, we are celebrating the fact that this is the shortest day. It’s all getting better from here. This is the bottom, it can’t get any lower, and there is some comfort in that fact. Mr E: Exactly and abundance, and warmth. In the previous equinox (Fall), we prepared for this drought time so we would have enough supplies to last through the cold, blustery winter. During the Winter Solstice, we celebrate to counteract the negativity of the winter doldrums. NL: Does the celebration also affect the energy in your life? NL: Does the Winter Solstice ritual change the energy? Mr E: Yes, it will make the energy happier and brighter. It lifts the spirits. NL: Do you just celebrate on the actual day of the Solstice (usually the 21st of December)? Mr E: No, we also celebrate on the day before and after. 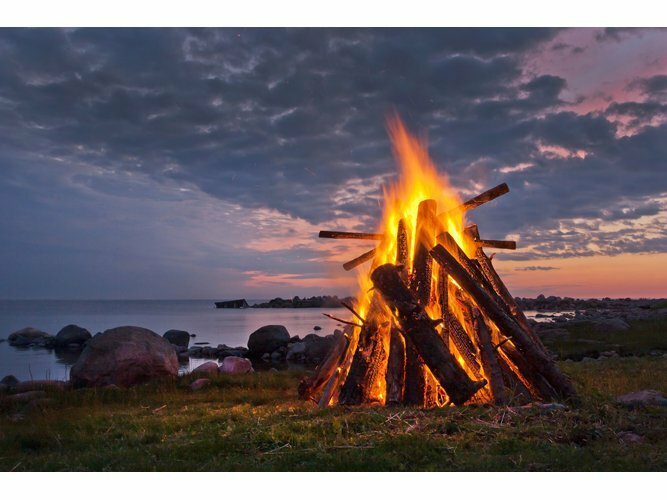 NL: Do you make a huge bonfire outside for the Solstice? Mr E: We do that for almost all of the big celebrations but, yes, we will stack wood up together, and burn it. We start to get it ready right after the Fall Equinox. That’s when we begin to stack up the logs and other stuff. The first day, we put the logs together, and make sure we put the extra, special stuff inside of them. We don’t just burn logs, there are other herbs and things that go with it. We mix them in with it, you see? The bonfire is kind of a teepee-type of structure, and we drape the herbs and vines and other things like that in there, in between. NL: You stuff the other greenery in between the logs as you are building the bonfire. It’s not a single, individual log. Mr E: Right. It isn’t just one log we are burning, this is a bonfire. NL: And you use dead wood for that? Mr E: Of course, yes. I think Holly, Mistletoe, and Juniper are also burned in there along with regular evergreens (Pines, Cedar, etc.) that create a lot of smoke. Pinecones and other things that will help the wood burn are thrown in there as well. 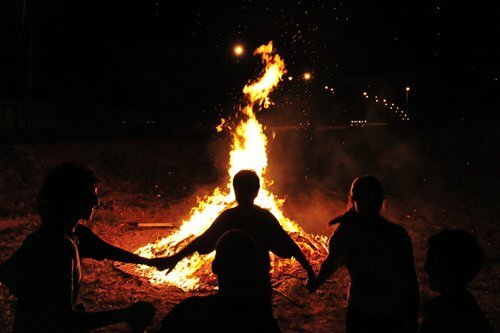 Then, there are songs that we sing around the bonfire, and circle dances that we do. NL: What is the meaning behind the songs? Mr E: We’re trying to lift up the spirits. NL: Is it about winter? Mr E: It’s about the fact that the dark days will be gone and it’s about welcoming the light that is coming soon. You know, “Be prepared for the abundance that is heading our way.” It’s mostly that kind of thing. NL: What happens on the first day? Mr E: Well, it’s kind of like a preparation type of thing. We serve special, little shortbread cookies with a syrupy, honey and nut combination–almost like a pecan pie type of thing–in the middle. In the castle, the whole town comes together, and everyone brings dishes to share, and we have a feast going on. NL: It sounds like this event is open for everyone who wants to celebrate. Mr E: Yes, and the royals officiate everything. There is a talk or a speech that we have to give and other things like that. We try to pep everyone up a little bit. NL: Can you give a little example? I imagine you’ve done it yourself. Mr E: I’ve done it many a time. It would be something like, “The day has come when this is our darkest day but remember, the light is coming back! Therefore, may Fyn be abundant and happy in the next year! It would be something along those lines, and the crowd would respond by cheering. Katie: Where does this take place, inside the castle? Mr E: No, in the center of town. NL: I pictured this indoors. Mr E: It can be indoors. If it’s too cold, we will have it in the Great Hall but, if you are an elf located in a warmer climate, you would be outside. Katie: What is the schedule of events? Mr E: Well, as I said, the first day, the bonfire is burned, and they have little treats afterward, like the cookie I told you about. Then they have a small feast, not a big one. It’s a shorter celebration. There’s a little bit of speeching and ale drinking going on there too. The second day is the actual Solstice and the fire is burned again, and we have the speeches and a big feast. Musicians are playing, people are dancing and drinking, and there are performers there too. The third day, the fire is burned again and afterward, there is a little luncheon type of meal with a bit of dancing going on, and that is the end of the celebration. NL: Aren’t people tired by the end of day three? Mr E: No, they are all excited and happy about it. It’s a very happy time, you know? Very interesting, I love the sound of the herbs in the bonfire and all that joy and dancing! I love celebrating solstice (summer and winter!) Happy Yule! Blessings for the new year and into the light we go! Yule is not so much a single day but a period of 2 lunar months starting from late november/early december on. A lot of the Christmas traditions today were actually taken from the pagan Yule traditions. It’s lovely to read about how the Elves celebrate Yule. The celebrations certainly sound fun. Wishing a Merry Yule to everyone!